The trucking industry is currently reliant on outdated tech fraught with paper trails, long wait times, and numerous middlemen that take advantage of independent truckers by pitting them in race-to-the-bottom competitions for loads. Founded by trucking veterans and transportation experts, LaneAxis started beta testing in 2015 after more than a decade of research and development. The seamless, expandable, one-stop freight management system offers a flexible, affordable pricing model for shippers, and is free for carriers. 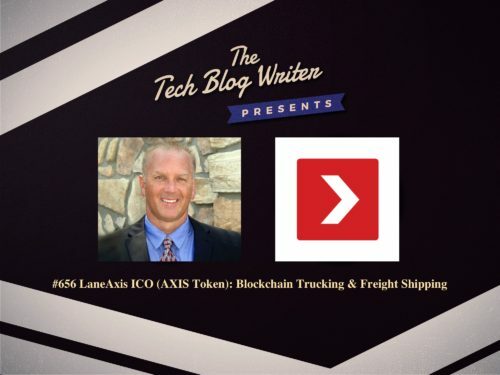 Rick Burnett is the CEO and founder of LaneAxis, and shares with me how they plan to disrupt the shipping industry by directly connecting shipper and carriers via a proprietary blockchain network. LaneAxis wants to use blockchain to eliminate these inefficiencies and empower truckers to take control of their industry. Rick has envisioned a unique deployment of Smart Contracts, GPS IoT tracking, and a mobile app that come together to help meet increased demands for shipping and lessen the effects of the current driver shortage. Several major shippers have already started utilizing the LaneAxis platform, including a prominent grocery chain. The ubiquity of cell phones in big rig cabs marked the last major hurdle for LaneAxis, which began development of the patents-pending freight management software 15 years ago. The simple-to-use app enables shippers to view and manage their cargo in absolute real-time, from pre-pickup to final delivery. That’s a first for an industry that for decades has relied on paperwork, phone calls, faxes, emails, and crossed fingers to ensure shipments reached their final destinations on time. On today’s tech podcast, we also discuss LaneAxis features such as route optimization, freight quality assurance, driver safety logs, and weather alerts. After more than a decade of dedication, Rick reveals how his team of collaborators and strategic advisors are ready to drive the Trucking industry into a new age of efficiency and profitability. Very useful Information. Several major shippers have already started utilizing the LaneAxis platform. Thanks for your wonderful work. This is so interesting! Thanks for taking the time and sharing it with us.